SOUTH Gloucestershire and Bristol councils need to work together to solve our ongoing parking issues. This is the call from Cheswick Village residents who are growing increasingly frustrated with commuter parking in the area. They say that it is drivers from the Ministry of Defence (MoD) and University of the West of England (UWE) causing the problems, but feel that South Gloucestershire and Bristol councils are doing little to tackle the problem. Roads with particularly problematic parking include Long Down Avenue, where commuters have been spotted parking on double yellow lines, Danby Street, Leader Street, Long Wood Meadows, Wider Mead, Great Copsie Way, Lawn Close, Home Leas and other adjoining roads. South Gloucestershire Council told the Filton Voice that it is in conversation with Bristol City Council about various parking issues in the area. They add that the double yellows in Long Down Avenue have now been refreshed and the road is being monitored by enforcement officers. In addition, the council has also received funding from developers to investigate and implement waiting restrictions in parts of Cheswick that are not covered by a scheme. Restrictions have already been implemented in The Bowery and Wood Mead areas, which include limited waiting bays to deter all-day parking. Residents say that these restrictions have pushed parking issues further into the estate. Kate Marks told the Filtonvoice that there is a “complete lack” of joint working between SGC and BCC. She said: “Cheswick has been developed as a self-contained village, straddling two local authorities, but their parking policies are in conflict. Claire Randall said: “The lack of a well thought out, joined up, cross boundary strategy to tackling parking issues is just creating more issues and moving the problems round the estate. Local councillor Trevor Jones told the Filtonvoice: “I have spent many hours consulting with residents on the detail of all traffic regulation proposals as they have been brought forward. “Implemented schemes are visited regularly by the council and I can report that a significant number of parking tickets have been issued in recent weeks. “The updated Residential Parking Standards policy only supports schemes when ‘Normally, 50% of dwellings have no off street parking, i.e. a garage and/or driveway available for one or more vehicles’. ‘Normally’ was inserted so that in the event that an area falls just above the 50% it could still be considered. I would anticipate that parking on all areas of the Cheswick development significantly exceed that policy stipulation. A South Glos Council spokesperson said: “Double yellow lines on Long Down Avenue have recently been refreshed and are being enforced by our parking enforcement officers. “A waiting restriction scheme has recently been introduced in The Bowery and Wood Mead area, and includes limited waiting bays to deter all-day parking by students. “In addition, we have recently received developer funding for the investigation and implementation of waiting restrictions in parts of the Cheswick development that are not currently covered. “As Cheswick sits so close to the border with Bristol, we are in conversation with Bristol City Council about the parking issues in the area. Nigel England, Community Liaison Manger at the University of the West of England (UWE Bristol), said: “The university takes its civic responsibility very seriously indeed and listens to and works with local communities. “We have consulted with people living on Cheswick estate and worked in partnership with residents, local councillors and South Gloucestershire Council. James Morvan, Travel Plan Project Officer at UWE Bristol, said: “In recent years we have invested in walking and cycling routes through campus, high quality cycling facilities and helped establish a comprehensive bus network that also benefits the community. 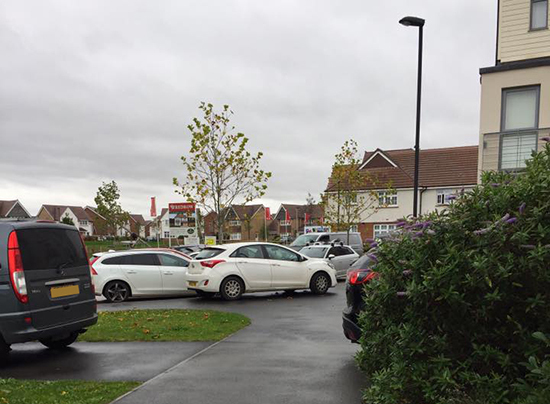 A Bristol City Council spokesperson said: “The council recently advertised proposed parking restrictions in the vicinity of the care home on Hatton Road. These restrictions were proposed to address concerns raised by residents through the developer on inconsiderate and unsafe parking. This work was funded by the development prior to adoption by the city council.